The Genesee River Trail is another great running opportunity in Rochester. The trail comprises some 24 miles in total, extends through the scenic, historic and cultural heart of Rochester, from the Erie Canal to downtown and Lake Ontario. It is alternately open and wooded. Highlights include a scenic gorge, three waterfalls, eight pedestrian bridges, and eleven parks (including four designed by Frederick Law Olmsted), and the 1822 Lake Ontario Lighthouse. 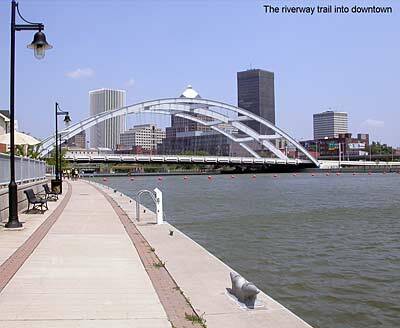 The most centrally located section to Rochester runs south from downtown to the University of Rochester — about 3.5 miles one-way, along the east side of the river. From downtown, you can also head north, to Lake Ontario, for 9+ miles, passing through Maplewood Park, Seneca Park, and other interesting sites. Add-Ons: Erie Canal Trail, El Camino Trail. At southern end of trail, great running in Mt. Hope Cemetery, Highland Park, campus of the University of Rochester.